Man Arrested After Suspicious Packages Sent To Consulates Throughout Australia Multiple consulates were evacuated after reports of suspicious packages. The suspect was charged with sending dangerous items through the postal service. 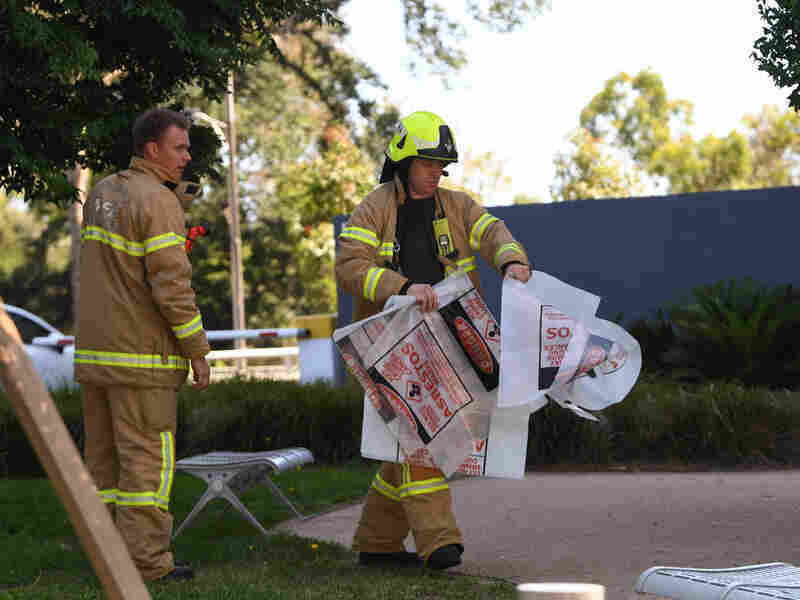 A firefighter carries a hazardous material bag into the Korean consulate in Melbourne. Several foreign consulates in southeastern Australia were evacuated Wednesday as emergency workers responded to multiple "hazardous material" events in the city. Australian police arrested a Shepparton man accused of mailing 38 packages containing a dangerous substance to diplomatic missions throughout southeast Australia. Savas Avan was charged with sending dangerous articles through the postal service, Australian law enforcement officials said in a statement. The offense carries a maximum 10-year jail term. The 49-year-old man was arrested at his home on Wednesday night. The substance in the packages is "suspected to have been sourced from his Shepparton home" in Northern Victoria, police said. Avan appeared at the Melbourne Magistrates Court on Thursday, The Associated Press reported. A Commonwealth prosecutor told the court the deliveries contained asbestos. Police said they had recovered most of the packages. A neighbor of the man, identified only as Gordo, told the Australian Broadcasting Corp. that the suspect kept to himself. "I knew something was weird with this guy because he's never out, never watered his lawns, nothing like that, that's why I kept away," Gordo said. Packages were sent to diplomatic missions of the United States, Britain, India, South Korea, Pakistan, Israel, Switzerland, Greece and Argentina, the AP reported. Emergency workers were also seen at the consulates of Italy, Spain, France and New Zealand, the BBC reported, citing Australian media. An official at Pakistan's consulate told ABC she opened a suspicious envelope Wednesday morning, "which appeared to contain asbestos." Authorities told her to wash her hands, she said. The affected consulates were evacuated, The Associated Press reports. The government Vic Emergency website noted several "hazardous material" incidents, the AP reported.